Across a crowded room, I saw you. Your bright colours, yet slightly sinister, artwork drew me in and I knew I had to look. Motora is simply put, beautiful. So, then we sat and played it. We proceeded to have one of the most bloodthirsty games we have had in a long time! Don’t let looks fool you, this game is brutal. 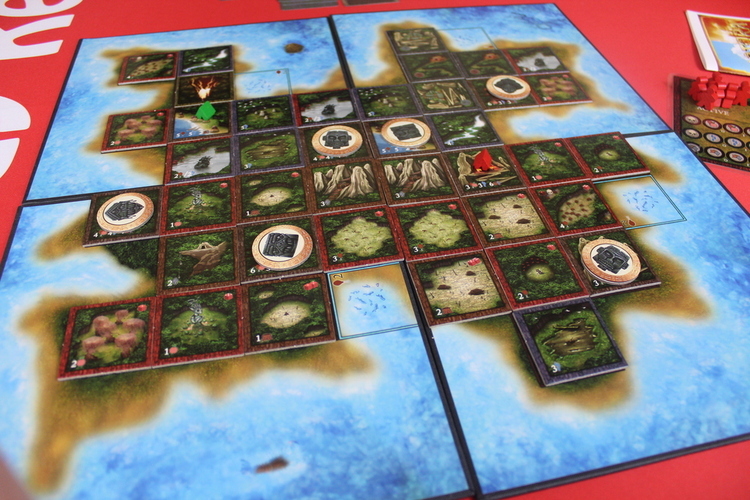 The island of Motora is in chaos, as resources become sparce, the tribes turned to the Gods and asked for help. The Gods demand that the Idols scattered across the land are retrieved and united again. 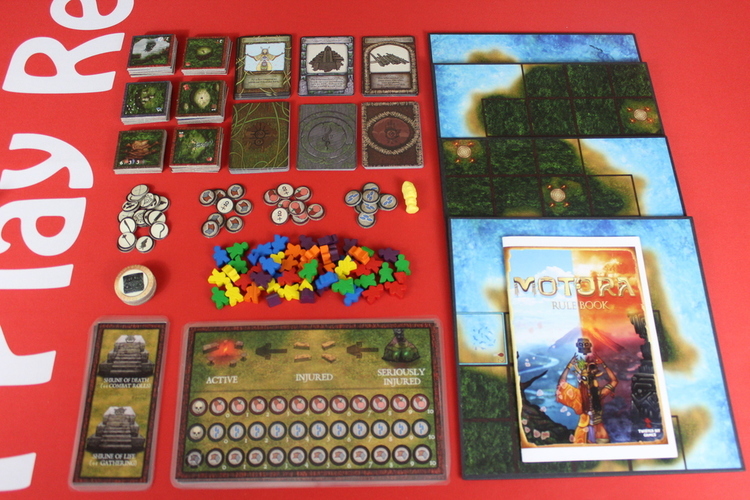 Motora is coming to Kickstarter soon, so bear in mind, this is a prototype version and some elements may change. There are two ways to win this game. Either, gather all the idols or eliminate all the other tribes. However, you will be trying to do this whilst managing your tribe's food, water, and shelter. Take the four board sections and place them together randomly, but so the island is in the middle and makes sense. Separate the tiles into two groups - villages and non-villages. The villages are the ones that show resource values at the bottom. Shuffle the two piles of tiles and then place villages on the designated spots. Fill the rest of the board randomly with the non-village tiles. 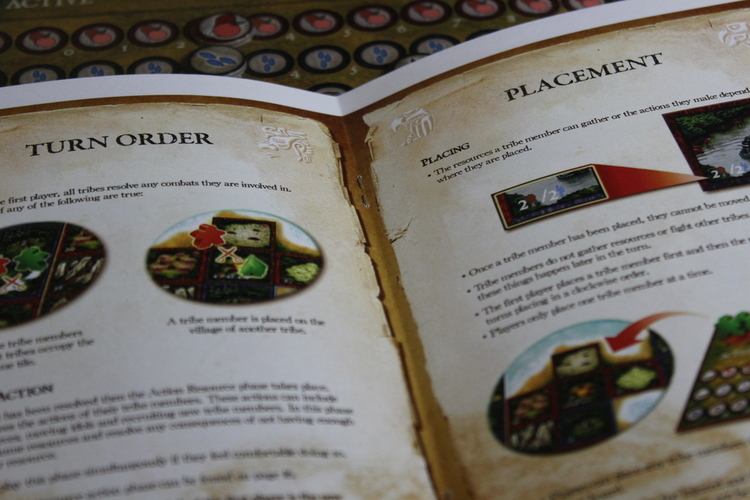 Shuffle the temple, craftsmen and event decks and place them by the side of the board. 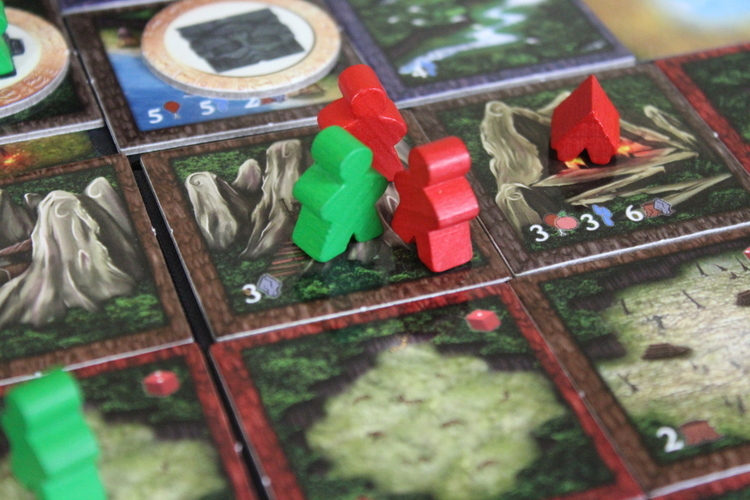 Each player takes a player board and the village and meeples in their chosen player colour. The hungriest player goes first! (No game snacks on the table today!) 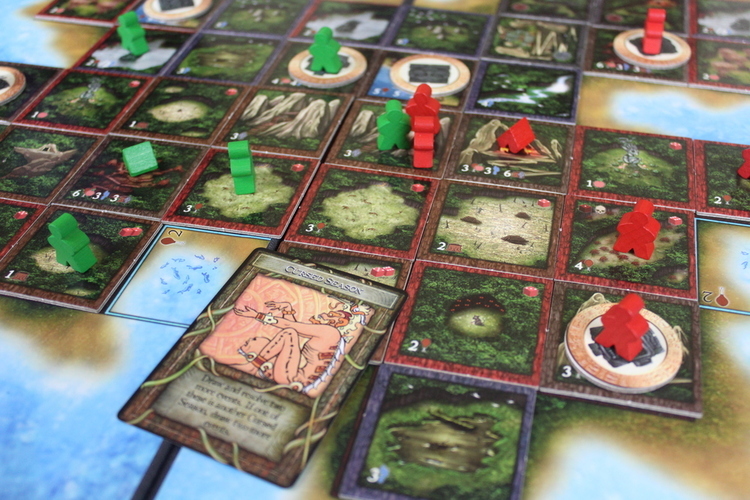 The first player chooses a village location and places their hut there, go round the table with everyone taking it in turns to place their hut. 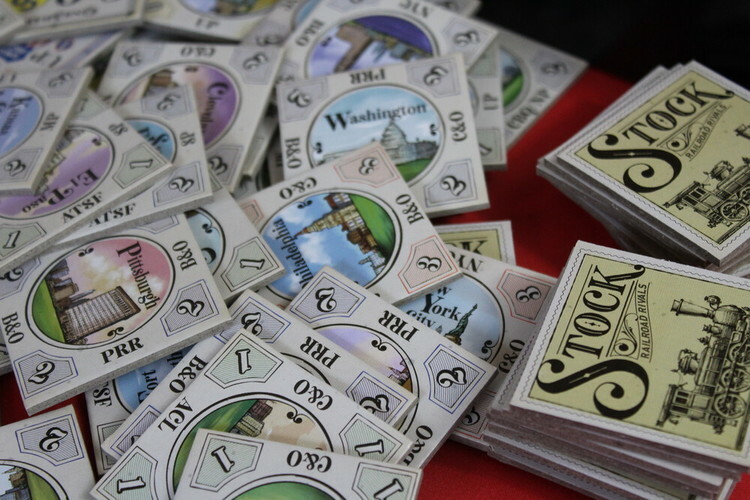 Use the resources markers to mark your starting resources on your player board. This will be the resources printed on your chosen village tile. Then place six meeples in the ‘active workers’ space on your player board. Flip over the villages tiles that weren’t chosen and place and Idol on these spaces. You are now ready to play! Beginning with the start player, take it in turns to place workers from their ‘active workers’ space onto places on the board. You may only place one worker at a time, later on, workers will take actions or gather resources depending on where they have been placed. Tribe members can be placed, for free, up to five spaces away from their village. You may place further away than that, but each space further out will cost you one shelter. Workers may never travel through, nor be placed on a volcano or ocean space. After everyone has placed two workers, an event card is drawn and resolved before placement proceeds. You may place multiple workers on the same space and you may place workers where someone else has placed (hence the combat phase!) This phase ends when everyone has placed all the available workers they have. 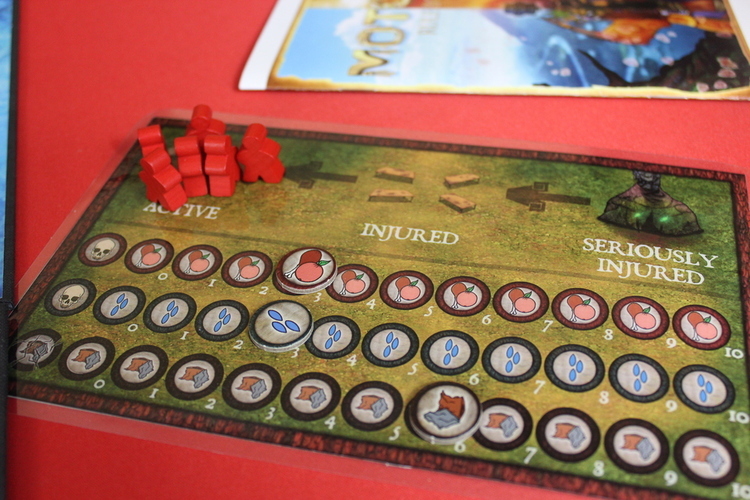 If multiple workers are involved in a combat only one worker can be killed or injured, the rest are placed to the side of the player board when combat has been resolved. Workers may also raid an opponents village. If the defending player has a worker on their village, combat happens as above (the defending player gets +1 to their roll). If not, pillaging occurs. The attack may roll a D6 and steal that number of food or water or destroy that number of shelter. They may alternatively choose to take back a captured worker, transport an idol or steal a piece of unused gear. Transport - If you have workers on a space with an Idol they may transport it one tile per worker on the spot, up to a maximum of two spaces. Once workers have complete their action they are placed back on the active worker spot on the player board. So, after gathering all your resources, now comes the time to use them! Each worker needs one food and one water to survive. If, after gathering, you do not have enough food, one of your workers will die and be removed from play. You can cannibalise an opponents worker you have captured at any point for six food. If you do not have enough water for your workers, a worker will die and be removed from play. Therefore the maximum number of workers you can lose in a round is two. If one of your workers is on your village, you do not need to feed or water them this turn. Each tribe then needs one shelter per round (regardless of the size of the tribe) If you cannot provide the shelter, then your tribe has nowhere to store their goods for the next round and your food and water are reduced to zero, along with losing any equipment cards you have. Once everyone is fed and watered, the next round begins. Play continues until either someone has taken the required number of Idols back to their camp (between 2 and 4 depending on player count) or until one player is the last tribe standing! Motora is one of the prettiest, yet brutal games I have ever played. On our first game Rob was left with one active worker for the majority of the game! As well as workers being killed from combat or lack of food/water, there are a few food spots on the board that you must fight in order to get food (Wild boars are tough to kill!) these can also cause you to lose workers.